lizabeth had been a good deal disappointed in not finding a letter from Jane on their first arrival at Lambton; and this disappointment had been renewed on each of the mornings that had now been spent there; but on the third, her repining was over, and her sister justified, by the receipt of two letters from her at once, on one of which was marked that it had been missent elsewhere. Elizabeth was not surprised at it, as Jane had written the direction remarkably ill.
“By this time, my dearest sister, you have received my hurried letter; I wish this may be more intelligible, but though not confined for time, my head is so bewildered that I cannot answer for being coherent. Dearest Lizzy, I hardly know what I would write, but I have bad news for you, and it cannot be delayed. Imprudent as a marriage between Mr. Wickham and our poor Lydia would be, we are now anxious to be assured it has taken place, for there is but too much reason to fear they are not gone to Scotland. Colonel Forster came yesterday, having left Brighton the day before, not many hours after the express. Though Lydia’s short letter to Mrs. F. gave them to understand that they were going to Gretna Green, something was dropped by Denny expressing his belief that W. never intended to go there, or to marry Lydia at all, which was repeated to Colonel F., who, instantly taking the alarm, set off from B. intending to trace their route. He did trace them easily to Clapham, but no farther; for on entering that place they removed into a hackney-coach and dismissed the chaise that brought them from Epsom. All that is known after this is that they were seen to continue the London road. I know not what to think. After making every possible enquiry on that side London, Colonel F. came on into Hertfordshire, anxiously renewing them at all the turnpikes, and at the inns in Barnet and Hatfield, but without any success; no such people had been seen to pass through. With the kindest concern he came on to Longbourn, and broke his apprehensions to us in a manner most creditable to his heart. I am sincerely grieved for him and Mrs. F., but no one can throw any blame on them. Our distress, my dear Lizzy, is very great. If gratitude and esteem are good foundations of affection, Elizabeth’s change of sentiment will be neither improbable nor faulty. But if otherwise, if the regard springing from such sources is unreasonable or unnatural, in comparison of what is so often described as arising on a first interview with its object, and even before two words have been exchanged, nothing can be said in her defence, except that she had given somewhat of a trial to the latter method in her partiality for Wickham, and that its ill-success might perhaps authorise her to seek the other less interesting mode of attachment. Be that as it may, she saw him go with regret; and in this early example of what Lydia’s infamy must produce, found additional anguish as she reflected on that wretched business. Never, since reading Jane’s second letter, had she entertained a hope of Wickham’s meaning to marry her. No one but Jane, she thought, could flatter herself with such an expectation. Surprise was the least of her feelings on this developement. While the contents of the first letter remained on her mind, she was all surprise — all astonishment that Wickham should marry a girl whom it was impossible he could marry for money; and how Lydia could ever have attached him had appeared incomprehensible. But now it was all too natural. For such an attachment as this, she might have sufficient charms; and though she did not suppose Lydia to be deliberately engaging in an elopement, without the intention of marriage, she had no difficulty in believing that neither her virtue nor her understanding would preserve her from falling an easy prey. She had never perceived, while the regiment was in Hertfordshire, that Lydia had any partiality for him, but she was convinced that Lydia had wanted only encouragement to attach herself to any body. Sometimes one officer, sometimes another had been her favourite, as their attentions raised them in her opinion. Her affections had been continually fluctuating, but never without an object. The mischief of neglect and mistaken indulgence towards such a girl. — Oh! how acutely did she now feel it. “It does seem, and it is most shocking indeed,” replied Elizabeth, with tears in her eyes, “that a sister’s sense of decency and virtue in such a point should admit of doubt. But, really, I know not what to say. Perhaps I am not doing her justice. But she is very young; she has never been taught to think on serious subjects; and for the last half year, nay, for a twelvemonth, she has been given up to nothing but amusement and vanity. She has been allowed to dispose of her time in the most idle and frivolous manner, and to adopt any opinions that came in her way. Since the — shire were first quartered in Meryton, nothing but love, flirtation, and officers have been in her head. She has been doing every thing in her power, by thinking and talking on the subject, to give greater — what shall I call it? — susceptibility to her feelings, which are naturally lively enough. It may be easily believed that, however little of novelty could be added to their fears, hopes, and conjectures, on this interesting subject by its repeated discussion, no other could detain them from it long, during the whole of the journey. From Elizabeth’s thoughts it was never absent. Fixed there by the keenest of all anguish, self-reproach, she could find no interval of ease or forgetfulness. Elizabeth jumped out; and, after giving each of them an hasty kiss, hurried into the vestibule, where Jane, who came running down stairs from her mother’s apartment, immediately met her. “She had better have stayed at home,” cried Elizabeth; “perhaps she meant well, but under such a misfortune as this, one cannot see too little of one’s neighbours. Assistance is impossible; condolence, insufferable. Let them triumph over us at a distance, and be satisfied. he whole party were in hopes of a letter from Mr. Bennet the next morning, but the post came in without bringing a single line from him. His family knew him to be, on all common occasions, a most negligent and dilatory correspondent, but at such a time they had hoped for exertion. They were forced to conclude that he had no pleasing intelligence to send, but even of that they would have been glad to be certain. Mr. Gardiner had waited only for the letters before he set off. When he was gone, they were certain at least of receiving constant information of what was going on, and their uncle promised, at parting, to prevail on Mr. Bennet to return to Longbourn as soon as he could, to the great consolation of his sister, who considered it as the only security for her husband’s not being killed in a duel. Mrs. Gardiner and the children were to remain in Hertfordshire a few days longer, as the former thought her presence might be serviceable to her nieces. She shared in their attendance on Mrs. Bennet, and was a great comfort to them in their hours of freedom. Their other aunt also visited them frequently, and always, as she said, with the design of cheering and heartening them up, though as she never came without reporting some fresh instance of Wickham’s extravagance or irregularity, she seldom went away without leaving them more dispirited than she found them. All Meryton seemed striving to blacken the man, who, but three months before, had been almost an angel of light. He was declared to be in debt to every tradesman in the place, and his intrigues, all honoured with the title of seduction, had been extended into every tradesman’s family. Every body declared that he was the wickedest young man in the world; and every body began to find out that they had always distrusted the appearance of his goodness. Elizabeth, though she did not credit above half of what was said, believed enough to make her former assurance of her sister’s ruin still more certain; and even Jane, who believed still less of it, became almost hopeless, more especially as the time was now come when, if they had gone to Scotland, which she had never before entirely despaired of, they must in all probability have gained some news of them. She had never heard of his having had any relations, except a father and mother, both of whom had been dead many years. It was possible, however, that some of his companions in the — shire, might be able to give more information; and, though she was not very sanguine in expecting it, the application was a something to look forward to. Every day at Longbourn was now a day of anxiety; but the most anxious part of each was when the post was expected. The arrival of letters was the first grand object of every morning’s impatience. Through letters, whatever of good or bad was to be told would be communicated, and every succeeding day was expected to bring some news of importance. I feel myself called upon by our relationship, and my situation in life, to condole with you on the grievous affliction you are now suffering under, of which we were yesterday informed by a letter from Hertfordshire. 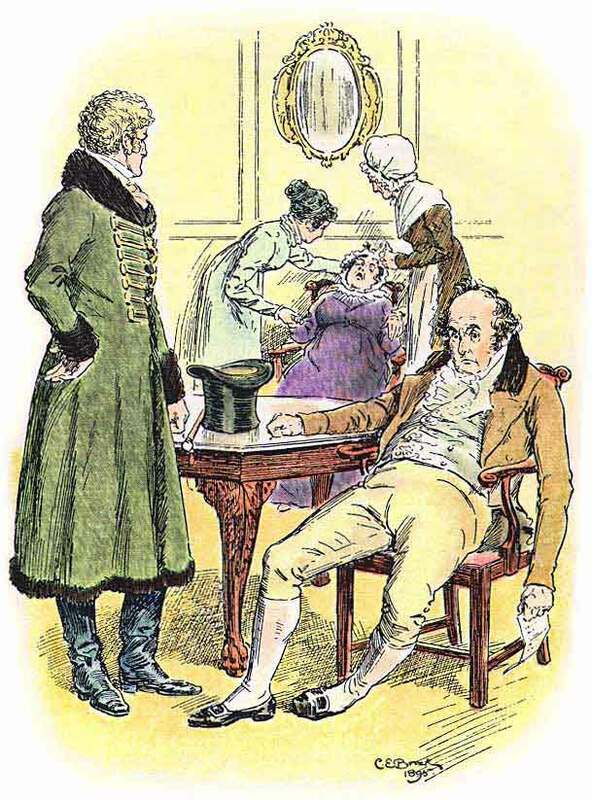 Be assured, my dear Sir, that Mrs. Collins and myself sincerely sympathise with you, and all your respectable family, in your present distress, which must be of the bitterest kind, because proceeding from a cause which no time can remove. No arguments shall be wanting on my part that can alleviate so severe a misfortune; or that may comfort you, under a circumstance that must be of all others most af-flicting to a parent’s mind. The death of your daughter would have been a blessing in comparison of this. And it is the more to be lamented, because there is reason to suppose, as my dear Charlotte informs me, that this licentiousness of behaviour in your daughter has proceeded from a faulty degree of indulgence, though at the same time, for the consolation of yourself and Mrs. Bennet, I am inclined to think that her own disposition must be naturally bad, or she could not be guilty of such an enormity at so early an age. Howsoever that may be, you are grievously to be pitied, in which opinion I am not only joined by Mrs. Collins, but likewise by Lady Catherine and her daughter, to whom I have related the affair. They agree with me in apprehending that this false step in one daughter will be injurious to the fortunes of all the others; for who, as Lady Catherine herself condescendingly says, will connect themselves with such a family. And this consideration leads me moreover to reflect with augmented satisfaction on a certain event of last November, for had it been otherwise, I must have been involved in all your sorrow and disgrace. Let me advise you then, my dear Sir, to console yourself as much as possible, to throw off your unworthy child from your affection for ever, and leave her to reap the fruits of her own heinous offence. Mr. Gardiner added, in his letter, that they might expect to see their father at home on the following day, which was Saturday. Rendered spiritless by the ill-success of all their endeavours, he had yielded to his brother-in-law’s intreaty that he would return to his family, and leave it to him to do whatever occasion might suggest to be advisable for continuing their pursuit. When Mrs. Bennet was told of this, she did not express so much satisfaction as her children expected, considering what her anxiety for his life had been before. The present unhappy state of the family, rendered any other excuse for the lowness of her spirits unnecessary; nothing, therefore, could be fairly conjectured from that, though Elizabeth, who was by this time tolerably well acquainted with her own feelings, was perfectly aware that, had she known nothing of Darcy, she could have borne the dread of Lydia’s infamy somewhat better. It would have spared her, she thought, one sleepless night out of two. They were interrupted by Miss Bennet, who came to fetch her mother’s tea.